Projects / Commissions / 50 Years of Wedded Bliss! Do the words Cypress, Impala, or March 30th mean anything to you? Probably not but all those words resonate and bring back great memories for a certain special couple! What better way to commemorate a milestone anniversary than in words that trigger great memories! 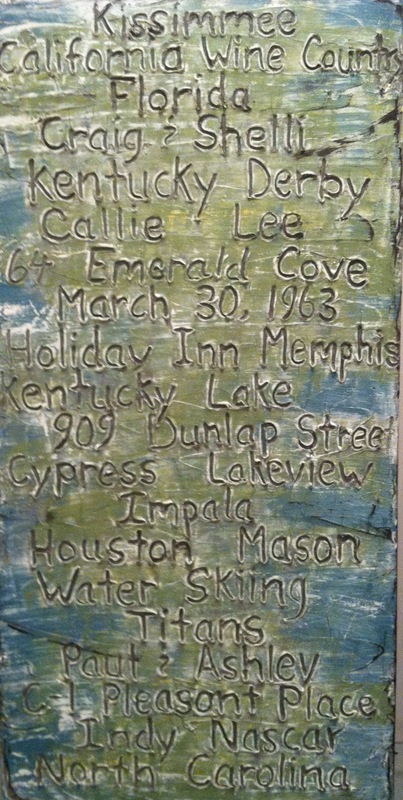 It’s 50 years of fun times like where they stayed on their honeymoon to memorable trips to names of children and grands! Even their anniversary date is on the artwork. This was a surprise gift from the children and grandchildren. I worked with them and guided them in coming up with the words and even in the color palette that was chosen. Word art pieces also make for a great gift for milestone events such as Graduations, Weddings, and Retirements! Feel free to contact me with any questions!